Hello everyone, and welcome to you. Today I am going to be talking about an enjoyable cooperative deckbuilding/deck drafting game called Marvel Legendary. Marvel Legendary belongs to the same family of games as Legendary Encounters, Predator and Alien, so there is a good chance that if you have played one then the mechanics of play will sound familiar to you. In each game between one and five players must face a Mastermind and foil his devious scheme, using their collection of Starting SHIELD personnel and building decks of heroes from those chosen at the start of the game. Play is straightforward. You have a hand of six cards. In front of you is the board, with five hero cards occupying the vacant spots in the HQ. Heroes are chosen by players at startup and with the variety of available expansions, the combinations are virtually limitless. When are we getting our red shirts? Or they can recruit heroes from the HQ using cards that have the recruit Icon. Any villains defeated go into their trophy pile, whilst any cards recruited go into their discard pile and form part of their deck. Once the player has finished doing all they can do, they discard any remaining cards and draw a new hand of six. Eventually, after they have had a few turns, they will start seeing their hero cards appear in their hand, which are significantly more useful than the starting hand. This version of the Legendary game is set apart from the other games of this type by the sheer number of hero combinations, Mastermind Combinations, Villain groups and schemes. Even in the core box, you have plenty to choose from. If, like me, you have a number of expansions I could play this game once a night for the rest of my life and literally never have the same game twice (Though I suspect book keeping that would be tiresone…). Whereas the Predator and Alien versions of the game feel cinematic, feel like you are part of the movie, Marvel Legendary lets you feel like you are in a comic issue foiling a plot with whichever team you want. Hero cards tend to have team affiliations and suits. Not everyone has a team affiliation (Basic Deadpool does not, for instance). This tends to be important as hero cards are more complex than simple SHIELD Cards. Many simply have high recruit or combat scores, though this is not their true strength. Some, actually probably most of the cards also have text on them that must be resolved when you play them. Others have text after one or more icons, either suits or team affiliations, on them. These are super powers. Super powers can be activated on the cards if on that turn you have already played the requisite number of cards with the appropriate icons prior to playing the card with superpowers. All the better to shoot bad guys with! Other cards have abilities that activate if certain game conditions are met. My favourite combination for this would be Blade and Moon Knight, both of whom are Marvel Knights. 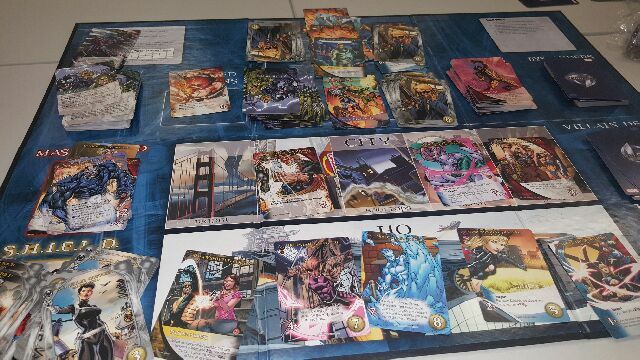 Blade is available in the Dark City expansion, whereas Moon Knight is available in Paint the Town Red. Both have cards that generate special abilities when they defeat people on the rooftops. (Blade gets them in the sewers too). For a full explanation, have a watch of this video. I love it when that happens in a game. That particular turn was the turning point in that game; from that point onward, the villains never got out of the sewers unless I wanted them to. And with the help of Forge’s BFG, Doom was utterly defeated. I mentioned Knockout a few moments ago. This is an effect in the game where players remove a card from their deck for the remainder of the game (Much like I did in the video). This might seem counter intuitive, however it helps make their deck better. In the first instance you will want to knockout your SHIELD cards which are low value. They take up space in your deck, thus slowing you down when you are drawing your hand looking for strong hero cards. Secondly, when wounds happen in the game they go into your discard pile, eventually taking up space in your hand. It is useful to be able to Knock them out too. I had heard the F4 expansion wa getting a reprint, would love that one I think…was the xmen expansion any good? Who did you get in it? Awesome. Hmm. I wonder if the fantastic 4 have annihilation wave. And mole man? They need mole man. A box with future foundation, including future foundation doom might also be cool. Hint hint people that make it!